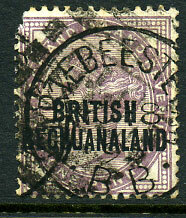 on GB ovp'd QV 1d (SG.61). Enlarged scan shows this to be "1061" and not an unrecorded "1001". 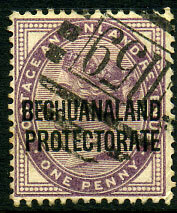 (D4) dated DE 7 -- (no year) on GB ovp'd QV 1d (SG.61). 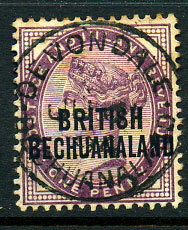 (D1) dated JU 4 99 on GB ovp'd QV 1d (SG.61). 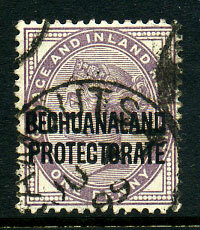 (D3) dated SP 19 04 on horiz. strip of three GB ovp'd QV 1d (SG.61), corner perf. fault. 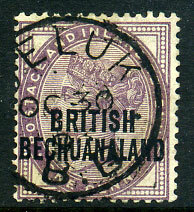 dated JU 26 95 on GB ovp'd QV 1d (SG.33). 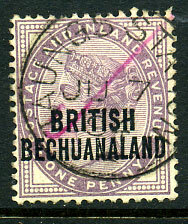 (D2) dated AU 10 98 on GB ovp'd QV 1d (SG.61). 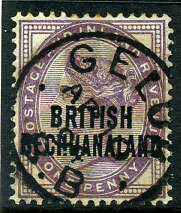 dated AU 2 9- (last digit unclear) on GB ovp'd QV 1d (SG.33). 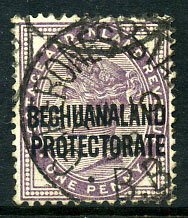 dated OC 30 93 on GB ovp'd QV 1d (SG.33). 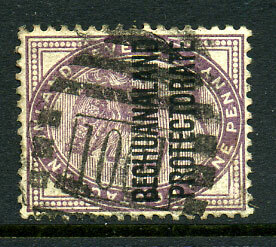 (D1) dated 1 AP 02 overstruck LOBATSI AP 4 02 on horiz. 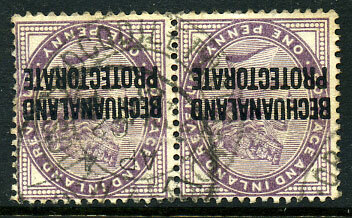 pair GB ovp'd QV 1d (SG.61), right stamp with marginal thin at right. 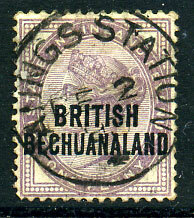 on GB ovp'd QV 1d (SG.33), diagonal red ink line. 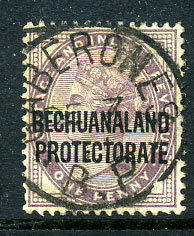 JU 6 94 on GB ovp'd QV 1d (SG.33), minor toning. 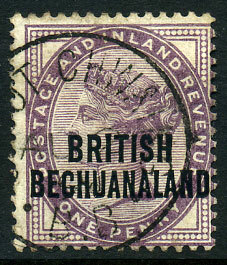 dated DE 2 93 on GB ovp'd QV 1d (SG.33), some thinning right side. 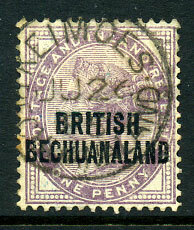 combination dated NO 18 93 overstruck fair clear '340' on defective GB ovp'd QV 1d lilac (SG.33). Extremely rare per Putzel with life of 12 months or less, unlisted by Proud. AP 10 94 on GB ovp'd QV 1d (SG.33).